Dear readers, something kind of weird has been happening here at Stylingo HQ. We basically – and I don’t know how to really say this to you all – Haven’t. Been. Shopping. Much. I don’t know if it’s because the weather has been going weird so we’ve held off on buying too many S/S bits, or if it’s because we’ve been squandering our wages on gin (err let’s be honest: it’s both), but it’s been a long time since we’ve bought enough stuff to constitute a haul post. FINALLY these last couple of weeks I seem to be back on my way to recovery and I’ve actually bought a few new pieces that I can now share with you all. Keep your fingers and toes crossed that the dry spell is over and we’ll soon be back to our reckless ways! So first up we have the above pair of heels, which were just £9 – YES, 9 ENGLISH POUNDS – from Primark. 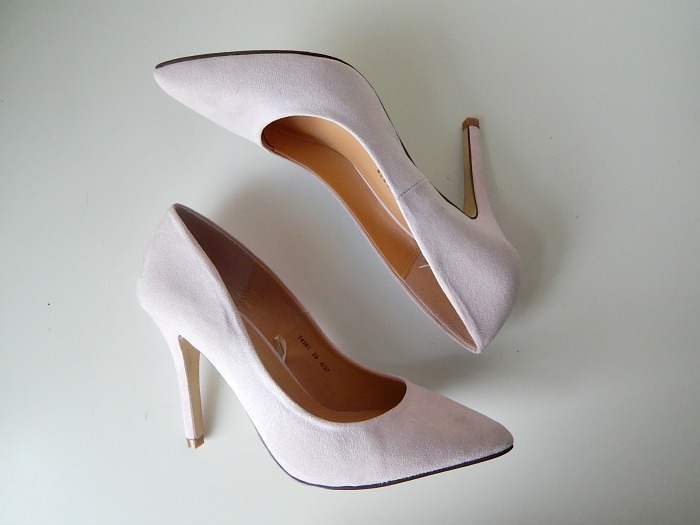 The camera hasn’t picked the up amazingly, but they’re a beautiful pastel pink faux suede. 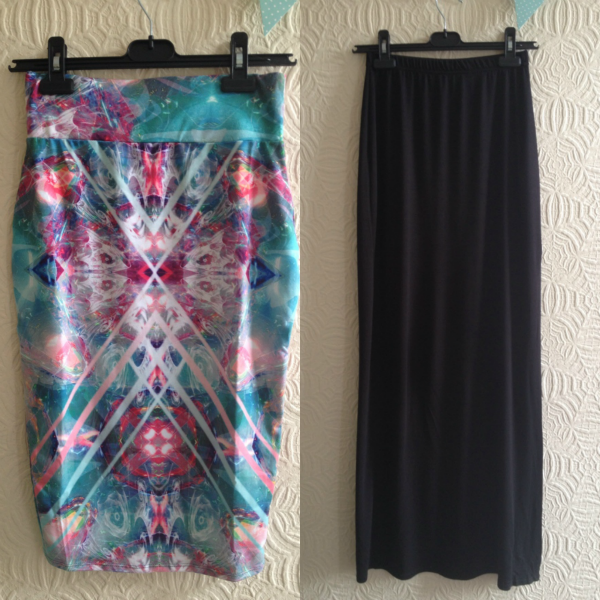 These will deffo get ruined on their first night out, but for £9 do you even care? 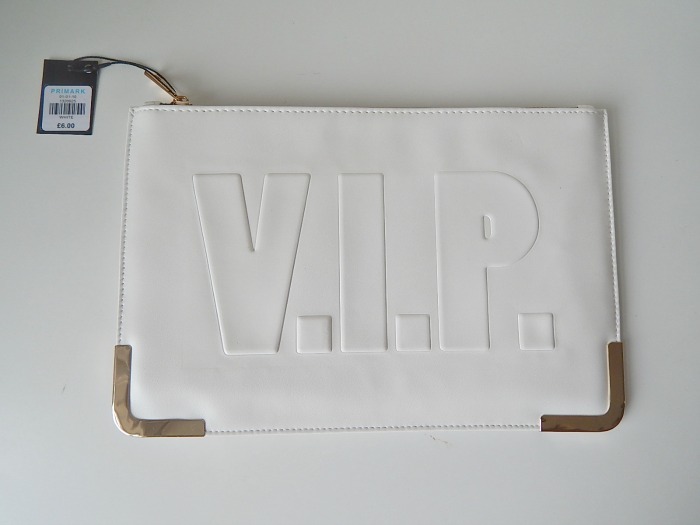 VIP Clutch – Primark. I’ve been a big fan of the embossed letter trend for a few months but I can never bring myself to spend more than a tenner on going out bags, so the ones from Miss Selfridge etc stayed where they were. So last week, I was super excited to see this little beauty in Primark too, and for just £6. The ‘VIP’ thing IS a tad cringey, especially considering where it was bought from, but hey – I’m a Very Important Peasant. With the gold corner detailing I do I think this looks more expensive than a standard Primark clutch, so it still gets a big thumbs up from me. 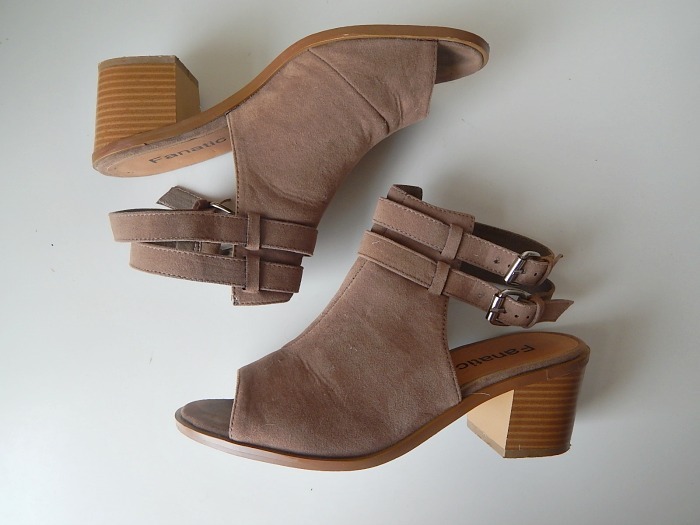 Faux Suede Shoe Boots – eBay. I needed some new day shoes to cope with this bizarre weather, and so I picked up these little hybrid things from this eBay seller. It’s all sensible warm shoe in the front, hot party summer shoe in the back. At only £18.99, these are a pure eBay bargain. I think they also do them in black, and there are some faux leather versions too. Longline Sleeveless Blazer – Misguided. 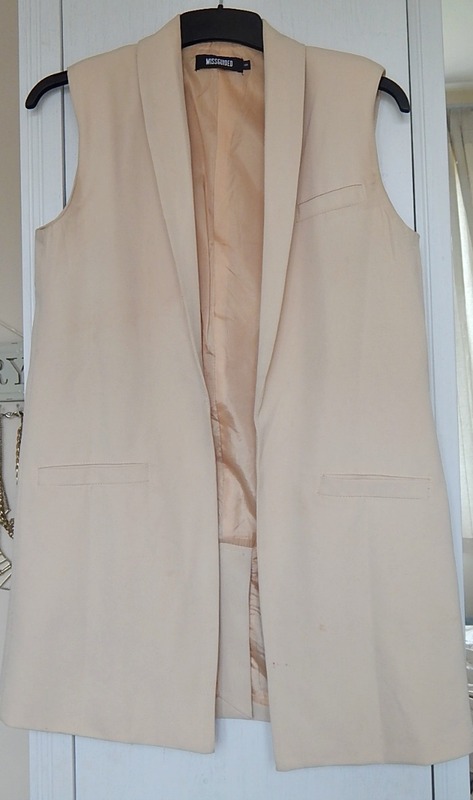 Sleeveless jackets are everywhere this spring, and this camel one from Missguided is SO nice for layering. It’s sold out and come back in quite a few times I think, and it can currently be bought in a size 10 or 12 so GO GO. Midi Dress: Pretty Little Thing. I’m going to Newcastle in a couple of weeks for some friends’ birthdays and wanted something classy to wear for the night out. Of course, for me ‘classy’ just means anything that means I won’t show my knickers when I fall over, so this bodycon cross-front dress from Pretty Little Thing ticked the box perfectly. It was only £15 so I wasn’t expecting much, but I’m actually in LOVE with it. As it’s scuba material it’s hugging but really flattering to the figure, and I’m honestly tempted to pick it up in a few different colours and be one of those girls. My main mission of the night will be seeing how clean I can keep the dress, of course (it’s already covered in makeup and I’ve only tried it on once). 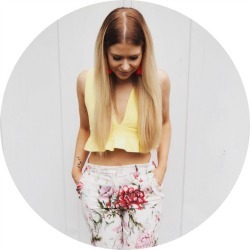 Crop Top – Pretty Little Thing. 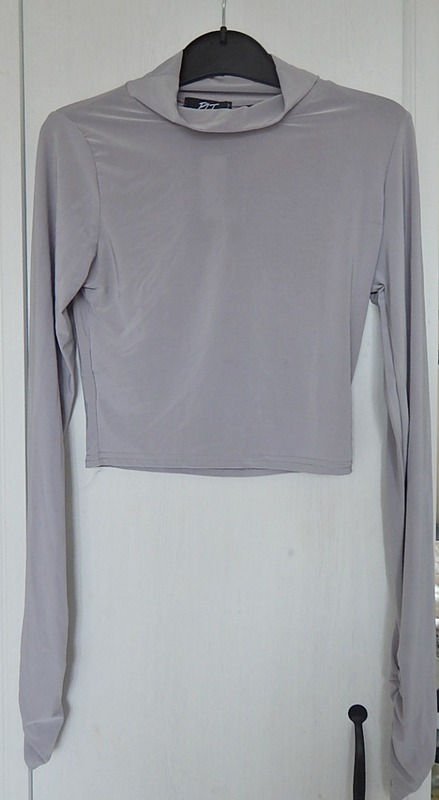 In the same PLT order, I also picked up this turtle neck crop top, which they also do in loads of different colours. It also comes with the matching skirt as a Kim K-inspired co-ord, but I’ve decided to wear it out over the weekend with a white skirt and my new pink shoes instead. Because I’m bloody wild and play by nobody’s rules. 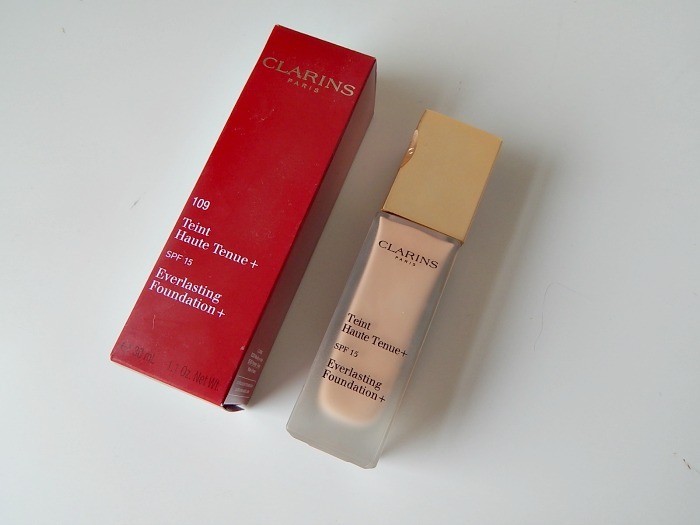 Clarins Everlasting Foundation – Debenhams. I found myself slowly becoming a little bored of my beloved Lancome foundation and so, after being really impressed with my Clarins Be Long mascara, decided to check out the brand’s foundation offering. I opted for Clarins’ full coverage Everlasting Foundation, and so far I’ve been very impressed indeed. I’ll have a full review of this coming very soon, so keep your peepers peeping. Fanci-Full Colour Styling Mousse – Amazon. I’ve just had new hair extensions fitted, and they’re slightly too yellow for my platinum/silver hair. 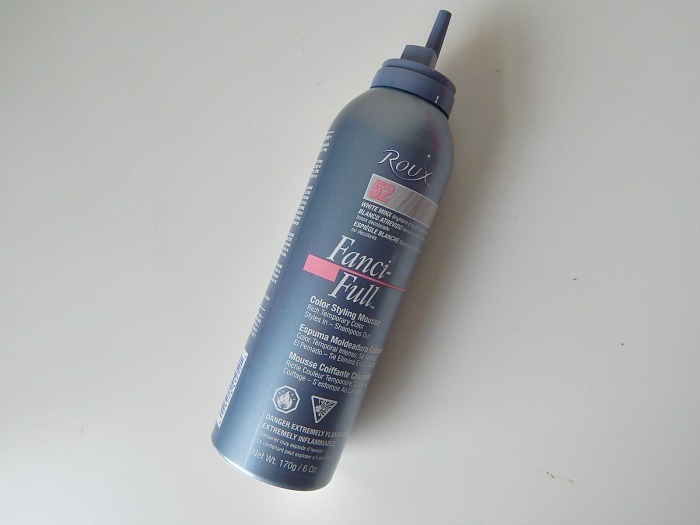 I decided to try this coloured mousse from Fanci-Full, after being quite a religious user of the liquid rinse last year. This too is supposed to give a semi-permanent wash of colour to tone brassy hair down, but I used it a couple of days ago and it did, er, nothing. I’m not sure if it’s because I got the white version as opposed to the silver, but I’m afraid it didn’t work at all. Sigh. 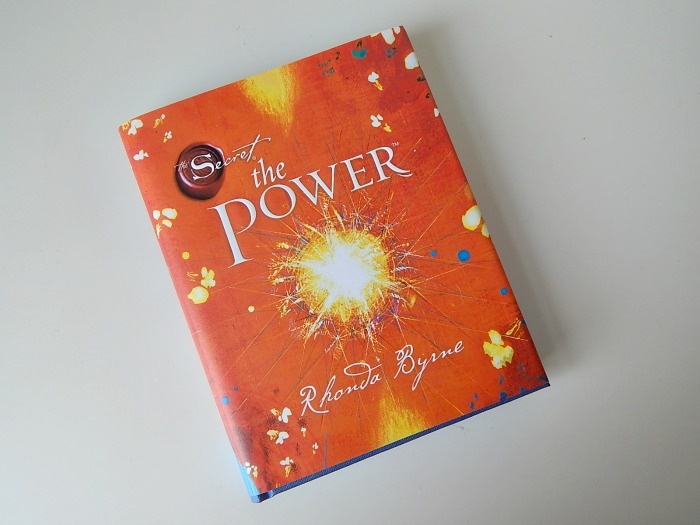 The Power – Amazon. When I’m not buying new pieces of makeup or pretending to be good at running at the gym, another of my main hobbies is annoying my friends by reading self-help style books and them telling them all about it. Last year I became obsessed with The Secret (though I never actually read it fully) and now I’m OBSESSED with the sequel, The Power. ‘Killing It’ Poster – Coco and Binx* Finally, we were actually gifted this but I thought I would throw it in for good measure. Coco and Binx sells a range of the most amazing typography prints, and also specialises in personalised posters that are great for weddings and birthdays etc. I’m currently in the process of jazzing up my bedroom with some artwork and the posters from Coco and Binx are right up my street. We received this Killing It print as well as the Flawless poster, and I can’t wait to get them framed and hung on the wall. What have you been buying recently? Let us know in the comments! Wow, that’s one hellova round up! I’m sorry to admit that I am ‘one of those girls’. 1 t-shirt, 5 colours. That clutch looks really pretty! So many beautiful pieces here, you have fabulous taste! Those suede shoe boots & Missguided sleeveless blazer are both stunning! You have really great style! And love the poster! 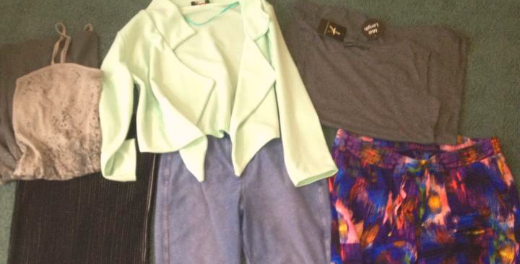 Ohh check you out with all those stunning PLT bits! And I adore that foundation…and can’t wait to see your review! I love those boots from Ebay!! So adorable and could work for all seasons.